One sunny day, Heather Nicole Hall, age 3, of Dallas, Texas, was visiting the ocean with Hannah, Kimberly and Trevor. Heather was in the shallow water collecting colorful seashells. As she reached for a bright pink shell,someone tapped her on the shoulder. It was a beautiful mermaid! Heather and the little mermaid swam toward the evil serpent's den. Along the way they met two playful dolphins. “We are Splish and Splash. Would you like to play with us?” asked the giggling dolphins. Heather told them, “We have no time to play. We must rescue the king of the sea. 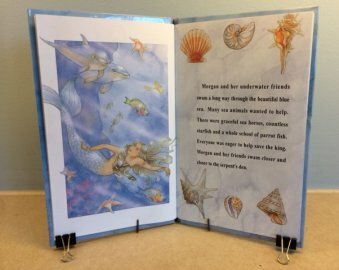 Come and help us!” Heather and her underwater friends swam a long way through the beautiful blue sea. Many sea animals wanted to help. There were graceful sea horses, countless starfish and a whole school of parrotfish. Everyone was eager to help save the king. Heather and her friends swam closer and closer to the serpent's den. The sea became cold and dark. Heather was a little afraid and wished Hannah, Kimberly and Trevor were there to help. From a distance, they could see Electra's den. It was in a sunken pirate ship. Guarding the entrance were two huge sharks with big teeth as sharp as knives. The king was trapped with his hands chained tightly by his sides. Heather explained the rescue plan to the sea animals and gave the go-ahead signal. The animals began swimming in circles like a swarm of wild bees around the serpent and the sharks! Heather quickly entered the den through a porthole and unlocked the king's chains. The mermaid's daddy was free! The king decided to hold a grand celebration at the palace in honor of Heather. Animals from all over the ocean were invited. Heather was crowned an honorary member of the royal sea family. Everyone danced and played merry music. “Hannah, Kimberly and Trevor sure would be proud of me,” thought Heather. 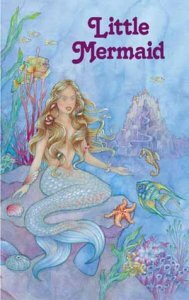 The beautiful little mermaid presented Heather with many brightly colored sea flowers and seashells. “Won't you please stay with us forever?” pleaded the little mermaid. Heather replied, “I must return to my home in Dallas, Texas. But I promise to return to the sea kingdom to visit.” Heather thanked the king and the little mermaid for the beautiful party and the wonderful gifts. The dolphins, Splish and Splash, gave her a ride to the seashore. Heather was happy to be home and could not wait to tell Hannah, Kimberly and Trevor about her wonderful adventure with the little mermaid.